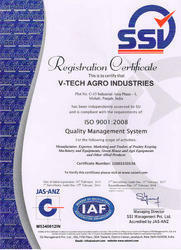 Established in the year 2010, we “V - Tech Agro Industries” are an ISO 9001:2008 certified organization engaged in manufacturing and wholesaling a premium quality assembly of Poultry Equipments. In the offered array, we provide Poultry Cages, Poultry Fans, Feeding System and many more. The offered equipment are high in demand across the nation as these are in-tandem with quality standards laid by international authorities. To ensure the same, we carry out the manufacturing process by using optimum quality raw material. Further, to ensure the quality of raw material, we procure it from the most reliable vendors of the industry and test it before usage. With an aim to attain the higher level of patron satisfaction, we provide the offered farm equipment as per the specifications detailed by patrons. To clearly understand the requirements of patrons, we make interaction with them on frequent basis. We design the offered array using modern machinery installed at our infrastructure, to ensure their fine finishing. All the processes are carried out in hassle free manner, owing to the support of our experienced and qualified teammates. Under the guidance of our mentor, ‘Mr. Vijay Singh’, we are able to employ the best of our ability. Owing to his persistent dedication, we have been able to cater to the varied requirements of our patrons. Leveraging on the support of state-of-the-art infrastructure, we are engaged in manufacturing and wholesaling a precision-engineered assembly of Poultry Equipment. To ensure the perfect designing of offered farm equipment, we make use of modern machinery in the manufacturing process. Further, to ensure the reliable functioning of offered farm equipment, we base these on latest technology installed at our infrastructure. To ensure the smooth functioning of machines, we update these on the frequent basis with the assistance of experts. After marking our presence in a domestic market, we are now ready to explore the market of other states, by rendering superior quality products and services. We want to engage the extremely competent people in our organization which will help us to generate top class services. We aim at providing fact-based services according to the defined parameter in order to figure put tomorrow's nutrition. Our organization is widely appreciated for manufacturing and wholesaling a wide assembly of Poultry Equipment. The offered equipment are manufactured in – line with globally laid quality norms by using a high-grade raw material in the manufacturing process. Moreover, the offered equipment are tested prior to delivery at patrons’ premises at our testing unit to ensure their ability to meet the requirements of the requisite industry. Our firm is supported by a team of assiduous professionals, owing to whose relentless efforts we have attained a commendable position in this domain in such a short span of time. Workforce working with us, carries out all the activities such as production and management in a productive manner, owing to which we have been able to meet the expectations of our clients. The team which works for us goes any length to manufacture the best gamut of Poultry Equipment. Along with this, our very well understands and respects diverse demands of the customers and makes use of assiduous efforts to gauge the same with a suitably tailored array.